Celebrate St. Patrick’s Day with the greenest beer in the province. Ontario Craft Brewers produce traditional darks and stouts with plenty of flavour and traditional Irish character. 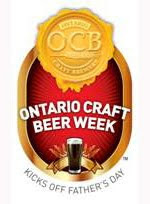 Go green this year and raise a fresh pint of Ontario Craft Brewers’ locally-produced, small-batch, low-footprint beers. Trafalgar Irish Ale - Trafalgar's version of this brown ale is reminiscent of the old style of Irish brewing. Brewed as an "anytime ale" this beer is smooth and refreshing. Willamette hops are used to provide a subtle background to the dominant grain flavours of the unique blend of four malts. It is best accompanied by rich and full flavoured dishes. Patty’s Irish Red - Irish Red was created in the 1800's by master brewer George Henry Lett. Trafalgar has recreated the extraordinary nutty taste and unique amber colour with crystal malts and roasted barley. Tettnanger and Saaz hops round out the bouquet of this fine dark lager. Paddy's compliments such pub fare as stews, cheeses and meat pies. St. Patrick’s Pick (Extra Special Bitter) St. Patrick's Pick is a hoppy pale or "bitter" ale brewed throughout Ireland . Consistent with the style, the hop flavours are allowed to dominate, giving this amber ale a lovely floral bouquet and thirst quenching bitterness. The hops rule! Foods with full flavour and heavy spices are an excellent compliment to St. Patrick's Pick. Cobblestone Stout - Brewmaster Joel Manning says, “It’s a classic, rich, dry stout porter, much lighter in flavour and alcohol than traditional English stouts. We use a mix of caramel malt, roasted barley, and nugget bittering hops to create its classic dark appearance, roasted malt character and bittersweet mocha flavour. Spring Bock - Amsterdam’s Spring Bock was the brewery’s first seasonal to be accepted in the LCBO in 2011 and it’s back again in LCBOs across Ontario for the 2012 spring beer release. “Six thousand liters sold out in a couple of weeks last year; so we made sure to brew more this year,” says Amsterdam’s media and marketing contact Blake Van Delft. “It’s a style that ages really well in the cellar too, so if you’re planning on picking up a couple of bottles, put one away for a few months (or a year if you can) to compare flavours.” Originally brewed only in monasteries for consumption during Lent, bock beers are the richest, creamiest, and most full-bodied beers in the world. Because of their high food energy and nutritional content, bock beer provided sustenance to monks who were required to fast for over 40 days and nights. If there was one beer you could literally live off of, this would be it. Fermented with a house strain of Danish yeast and aged three times longer than other beers, Amsterdam Spring Bock is a seasonal brew you do not want to miss out on. Steam Whistle Pilsner – With a philosophy of "Do one thing really, really well", this award-winning Toronto brewery and thriving tourist attraction knows how to make a good, green beer. The brewery focuses on a single brand, their Steam Whistle Pilsner, under the watchful eye of Czech-trained brewmaster Marek Mikunda. It’s known as Canada’s Greenest Brewery for its sustainability practices (powered 100% by green electricity, delivering with Bio Diesel, using Deep Lake Water Cooling), and for its water and energy conservation practices. Sustainable suds for a conscious drinker. Steam Whistle St. Patrick’s Day Party at the brewery in support of the Toronto St. Patrick’s Day Parade Society: Saturday March 17th 2pm-midnight, Entertainment by Brogue, Poor Angus and the Woodgate-Shamrock Irish Dancers. $15 at the door. Strong Patrick Irish Red - For St Patrick's Day, Beau's is brewing a Strong Patrick Irish Red that will be available in March. This special brew is a strong partially barrel-wood aged interpretation of Irish Red Ale. Tasting Notes: A luscious red-hued ale with a malty backbone showcasing toasty and toffee notes complimented by whiskey flavours with underlying wood and vanilla nuances. Beaver River I.P.EH? - spring seasonal India Pale Ale now available. Beaver River marries the typical flavour profiles of the British and American interpretations of an India Pale Ale. Expect a bold yet balanced blend of hop bitterness, estery yeast character and a blend of both citrus and earthy hop aromas. Beaver River is an assertive beer and as such, should be paired with equally assertive foods. Spicy Mexican or Indian food, wild game and pungent or smoked cheeses would be ideal. Texas Tea Honey Stout - Dark smooth and rich, enhanced with natural local honey, giving a subtle sweetness and Offsetting the deep rich bitterness of the original stout. Neustadt 10w30 Brown Ale - A traditional dark English Mild. The term mild meaning “not bitter” does not refer to strength. Using pure natural spring water, New Zealand hops and imported specialty malts. Giving rich malt and light nut aromas and mellow malt and good hop notes to the palate. A smooth and easy drinkable ale. Perfectly partnered with beef, steaks, stews, goulash or kebabs. What's Green, part Irish and tastes great? KELLY GREEN, the latest St. Patty's day inspired OCB beer cocktail. *Add another 1/4oz of Blue Curaçao for a sweeter & greener version. Amsterdam Blonde serves as the perfect smooth, crisp and well-balanced lager that can hold its own against the bite of the whiskey. With Blue Curacao in the mix, sweet and lively citrus notes soften any of the whiskey's remaining severity while transforming your drink to a green and playful St. Paddy's day cocktail. Kelly may look like a sweet Irish lass but beware she packs a potent punch. Come by DeSotos, 1079 St. Clair West in Toronto to try out the KELLY GREEN cocktail.